So far, weather has been pretty good. Only negative has been the wind, and we have had some wind the past few days. Temperatures have been in the mid 60s the past few days, but we are expecting upper 30s? on Tuesday. Burrrrr! Not a whole lot better Wednesday, when it is predicted to be in the mid 40s. Low 50s Thursday, creeeing into the mid to upper 50s by the weekend. Once we got through the draw down, we have only seen a low one unit come on for maybe one hour some time in the morning. Projection for tomorrow is more of the same. Low one unit on for an hour at 10:00 a.m. Monday currently shows two units on for two hours at 7:00 a.m. and a little over one unit on for two hours at 7:00 p.m.
Jim and Brenda, from Oklahoma, spent the morning on the water with Stan last Saturday. Not a great day, but certainly not a bad day for these two on the copper dun midge. Super windy and no generation going. Sunday, Jim took Ward and his father, Ken, from Kansas out for half a day. They had a fun day on the P&P and copper dun midges. Also landed some on a gray scud. Stan had Mike, from Iowa out. They had a good day on the P&P and the black midge with a copper head. Bob, from Michigan, spend most of the day on the water with Stan Monday. Pretty good day for Bob on the copper dun and copper head black midge. Had some fun catching on the big ugly in the shallows. This was one of the days when the generation was very low, so flow was certainly minimal that day. New fly fishing lady, Sandy and her husband, Bryan, spent half a day on the water with Carolyn Thursday. Lots of stuff to learn, but she is taking to it like a fish to water. Caught a few fish on the ruby midge, but probably the best pattern for both Sandy and Bryan was the CQ streamer on the 1.5 ips sinking line. Sandy liked fishing this way. Stan had Wayne and Coleen, from Hawaii on the water for the morning. Good, fun day for these two on the P&P and ruby midges. Ralph, one of Jim’s regulars, spent all day on the water Thursday with him. Good day for Ralph on the ruby and P&P midges, and a gray scud.Friday, another good day for Ralph, who when out with Jim again, on pretty much the same patterns, the ruby and P&P mdiges and a gray scud. Wayne and Coleen didn’t get enough on Thursday, so they spent another morning on the water with Stan. Another good day for them on the P&P & ruby midges. Possibly another new woman fly fisher in the making. Betty and her friend, Debbie spent the morning with Carolyn. 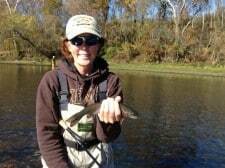 Although Debbie was more focused on learning technique, she did manage to catch a few fish on a ruby midge. Betty is not new to Taneycomo and she was down stream a little distance catching at least one fish on almost every midge she tried. 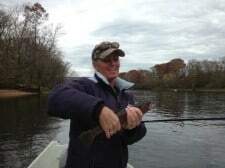 This entry was posted on Saturday, November 9th, 2013 at 10:09 pm	and is filed under Fishing Reports. You can follow any responses to this entry through the RSS 2.0 feed. You can leave a response, or trackback from your own site.